STREET CRY (IRE) (Bay or Brown 1998-Stud 2003). 5 wins-1 at 2, Dubai World Cup, Gr.1. Champion Aust. Sire 2015-16. Sire of 1300 rnrs, 895 wnrs, 108 SW, inc. Zenyatta (Breeders' Cup Ladies Classic S., Gr.1), Winx, Street Sense, Shocking, Whobegotyou, Tomcito, Long John, Street Boss, Pride of Dubai, Seventh Street, Stay With Me, Lyric of Light, Victor's Cry, Majestic Roi, New Year's Day, Here Comes Ben, Street Hero, Cry and Catch Me, etc. Lonhmacc (g. by Lonhro). 3 wins at 1200m, MRC Appelles H.
Evilweb (Encosta de Lago). 6 wins. See above. Web of Love. 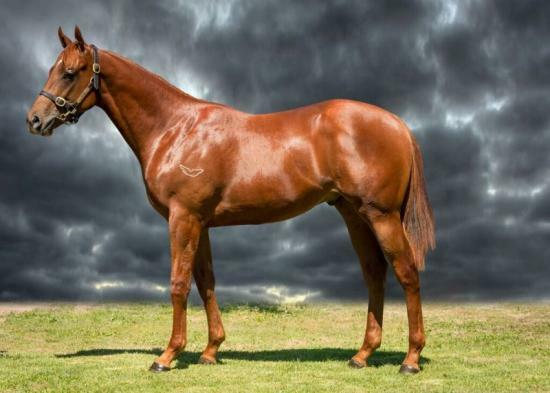 5 wins-1 at 2-from 1400m to 1600m, A$117,250, BRC Acadia Landscapes P., AJC Vaucluse 2YO H., BRC Carlton Mid H., Brc.com.au P., 2d BRC Twitter.com H., 3d Qld Tatt's RC Carlton Draught P.
Prussian Heart. 5 wins-1 at 2-from 1000m to 1800m, A$139,650, BRC Kendrick Racing H., Sky Racing World 2YO H., Ipswich TC City of Ipswich H., 2d BRC Canadian Club 2YO H., Gallopers Sports Club H., 3d BRC JAHM H.
Red Bowers. 7 wins at 1000m, 1200m, A$120,990, to 2015-16, 2d BRC Ascend Sales H., Ipswich TC Civil Pro H.
Equal Luck. Winner at 900m in 2015-16, 2d Ipswich TC Sirromet H.
Takings. 2 wins at 1200m in 2015-16 in Aust. Daddy Longlegs. 2 wins at 1200m in 2015-16 in Aust. Don't We Love It. 4 wins-1 at 2-to 1400m to 2016-17, TTC Neil Buckby Landrover H., Devonport RC Birdcage Tavern H., 2d Tasmanian Farmer H., Devonport RC Birdcage Tavern & Function Centre H., Tasracing.com.au H., Bird Cage Tavern & Functions H., 3d Devonport Racing Club H.
Golfing. 5 wins at 1050m, 1200m, A$90,250, to 2016-17, 2d MRC (Mornington) Musk Creek Farm P.
Angel of Liberty. 2 wins at 1200m in 2015-16 in Aust. ABBI'S CHOICE (Slewacide). 19 wins to 6½f, US$379,181, Remington Park Autumn Classic H., L, Fair Meadows Tulsa Sprint S., L, Tulsa Dash S., L.
DR. PANGARITO (Country Doctor). 7 wins in Argentina, La Plata Handicap Libertad, L, San Isidro Handicap Zanoni, 2d San Isidro Clasico Pippermint, Gr.2, 3d San Isidro G.P. Suipacha, Gr.1, Handicap Saint Wolf, L.